Phnom Penh, two experts from Indonesia and the Philippines shared their experiences on how responsibilities for basic service delivery have been transferred with the necessary financial and personnel resources to local governments in their countries with various Ministries and representatives of sub-national administrations in Cambodia. 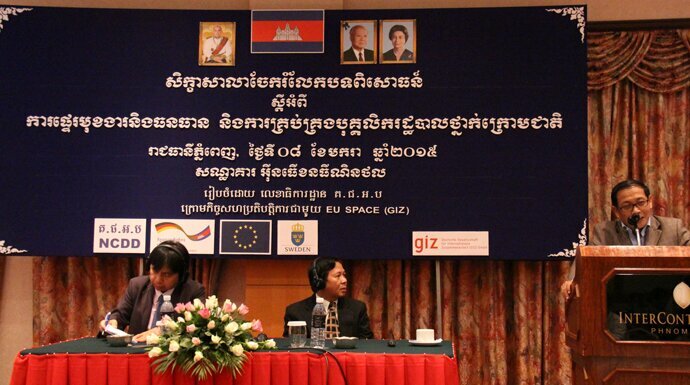 “There are good experiences in ASEAN countries and Cambodia should learn from those countries”, underlined H.E. Sak Setha, Secretary of State, Ministry of Interior and Head of NCDD Secretariat. The Secretariat of the National Committee for Sub-National Democratic Development (NCDD), which is responsible for coordinating the government wide democratic decentralization reform in Cambodia, had invited the regional experts to inform the efforts of the Royal Government in this regard. 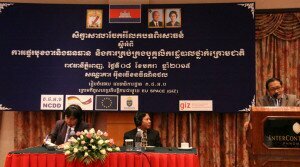 The expert visit was facilitated by the NCDD Secretariat in cooperation with the joint European Programme for “Strengthening Performance, Accountability and Civic Engagement of Democratic Councils in Cambodia” (EU SPACE), which is implemented by GIZ. Read more at the NCDD website in English or in Khmer.